The inventor of sure-fire failures leads such an abysmal life that he creates a second identity that of a dashing, debonair womaniser. Q: Does anyone know where I can source a DVD or VHS copy of Arthur ! Arthur ? ...then ARTHUR? ARTHUR! is the movie for you. This obscure psychedelic psychiatric comedy was already quite dated when I saw the film 20 years ago on the late late late show, so I can only imagine now how it seems. But even as minor as I feel it is, I'd love to see this movie on the tube again,simply because having a late late show at all these days which would show curiosities like this would be a sense of rebellion. Donald Pleasence is one my favourite character actors, and he specialized in playing batty obsessives, recluses and oddballs. 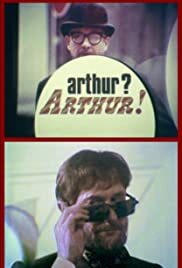 While obviously not having seen everything in his massive filmography, I would venture that Arthur is probably the most normal role he has ever played. Arthur is an everyman- so average that he seems to disappear into the film's bland, cramped settings. On the advice of his psychiatrist, he ventures out into swinging London to find some happiness. This very low-key picture is as bland as the title character, although it strains to be a wacky, trippy psychedelic look at swinging London life (and there were so many pictures like this in the day). The most memorable scene, I have already alluded to in the summary above. But why that is, is because this coupling is performed while a Felliniesque parade of hipped-out oddballs prance around the bed, but also, this scene is actually rather touching because movies seldom portray anyone bigger than Twiggy as being healthy, sexual human beings.